Twitter’s Vine has just given its users their own web profiles, plus a new TV mode that allows viewers to watch their six-second-long videos in full screen mode. While Vine announced it would be opening up vanity URLs to its users in December 2013, in anticipation of allowing them to create web profiles, this move isn’t exactly a surprise. Still, the social media service, famed for only giving viewers six seconds to get something across in a video, seems to have added on some of the same features that other social networks offer using its new site, Vine.co. For example, it has now launched a home feed, plus it’s given users the option to like, share, and comment on the videos they come across. (Image: Vine). 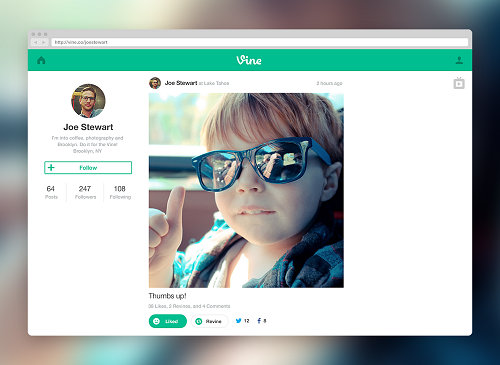 Example of a Vine web profile. With TV mode, the social media service is making it more convenient for users to watch a string of videos all at once. Though considering each video is six seconds long, it’s essentially like watching a string of GIFs in succession. To open TV mode, viewers can click the button in the upper right corner of their feed, or of another user’s profile, to see a series of the videos they’ve posted in full screen. “This release is just a first step toward bringing you a richer, more enjoyable web experience. 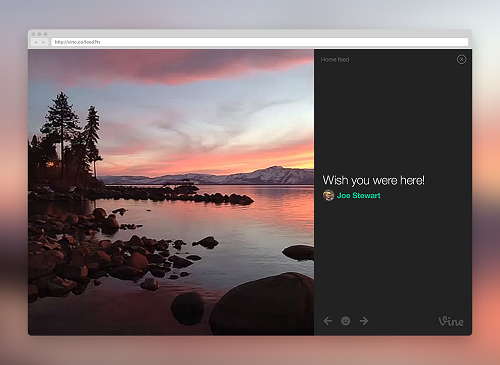 We look forward to introducing more improvements in 2014,” said Vine engineer Janessa Det in a blog post. It’s not clear if that will involve more features for the web versions, but it’s safe to say Vine has made the jump from being primarily mobile-focused to also looking at creating experiences for the Web.